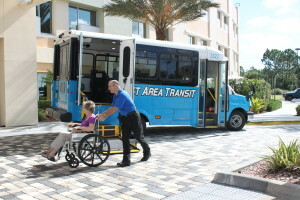 Space Coast Area Transit operates Paratransit services to serve the mobility needs of those who are unable to utilize fixed routes by providing wheelchair accessible Paratransit vehicles, which carry passengers throughout Brevard County on a daily basis. View the Rider’s Guide for Special Services, a public transportation rider’s guide for eligible seniors and transportation disadvantaged, including origin to destination Paratransit Service and ADA Paratransit Service. Paratransit is generally a curb-to-curb service accessed through a trip-by-trip reservation. Space Coast Area Transit provides such services in order to meet the needs of the transportation-disadvantaged citizens of Brevard County. 1-Ride Paratransit Fare is paid when boarding. Exact change is required, as the driver is not equipped to make change. 1-Ride Paratransit Fare is a $1.50. A 10-Ride Paratransit Pass is $15.00 and must be purchased in advance. For Paratransit eligibility requirements, call 321-633-1878 or E-mail us. Paratransit qualified passengers ride at a reduced fare. Individuals must go through the Paratransit registration process and become eligible to receive Paratransit service. Those eligible for Paratransit include seniors 60 +, veterans, students and transportation disadvantaged. Transportation disadvantaged individuals are defined as, “Those persons who because of physical or mental disability, income, status, or age, or who for other reasons are unable to transport themselves or to purchase transportation and are, therefore, dependent upon others to obtain access to health care, employment, education, shopping, social activities, or other sustaining activities, or children who are disabled or high risk,” Chapter 411.202, Florida Statutes. For questions regarding eligibility or to make a reservation for Paratransit service call 321-633-1878 and ask to speak with a Paratransit representative. In South Mainland, call 321-952-4672. E-mail us!